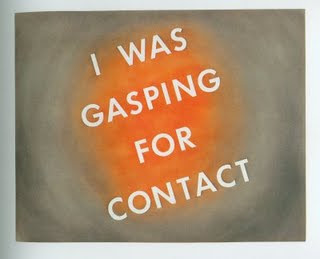 Ed Ruscha, I Was Gasping for Contact, Pastel on Paper, 1976. Around 7 o’clock, I went to the Robert Mapplethorpe opening at the Alison Jacques Gallery. The sidewalk was crowded with art aficioados rapturously waiting for Patti Smith to play an intimate set in honour of her close friend Robert Mapplethorpe. She began to sing in the doorway of the gallery: When we were young, we had imagination, we had each other… In between songs Patti spoke about walking around New York with Robert. Standing quite close I sketched her and wrote down her words. On the topic of AIDS awareness, she said, “It doesn’t mean we can’t have fun. It doesn’t mean we can’t be free. It just means we have to love our life and take care of it.” She also advised, “All of you in the next week or two, read Rimbaud, read Jim Carroll and look at Robert.” When Patti sang acapella Because the Night, everyone went silent before tentatively beginning to sing along. She sounded amazing and sincere. from the lights along the thruway. the direction which you are taking? Jim Carroll died a few weeks ago. Here is his obituary.